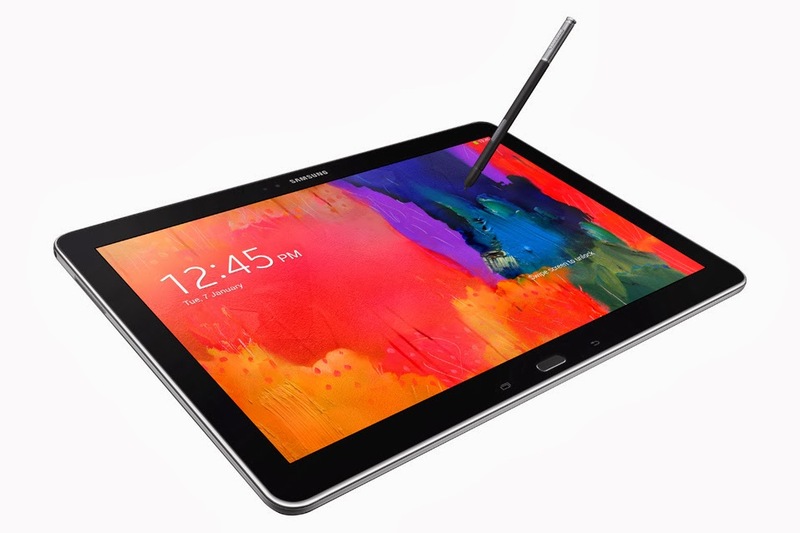 In their pursuit for dominance in the tablet market in 2014, Samsung has announced, at its CES 2014 show, four new tablets under the NotePro and TabPro names. The Galaxy NotePro 12.2 takes the spotlight, while the Galaxy TabPro 12.2, 10.1 and 8.4 followed it. As the Pro designation suggests, these are high-end tablets, hence, they'll be on the expensive side. All four Galaxy Pro tablets feature 2560 x 1600 displays and are available in Wi-FI only and LTE versions, and are powered by either the Exynos 5420 processor or the Qualcomm Snapdragon 800. This is perhaps the most interesting of these four tablets. The Galaxy NotePro 12.2, basically a larger Note 10.1 (2014), explores a display size that is seldom used in tablets. Some people (me included) think that 12.2" is too large for a tablet, while others may appreciate the extra screen real estate. The NotePro 12.2 has a very high 2560 x 1600 resolution, which leads to a 247ppi pixel density, just shy of the iPad's 264ppi (but then again, 1600p is pretty much the limit for tablets for the time being). The tablet is 8mm thick and weighs 750g for the Wi-Fi version and 753g for the LTE version. It's a very heavy tablet due to its footprint, but I suppose that the weight must be well distributed. The Wi-Fi variant is powered by an Exynos 5420 processor, which consists of four ARM Cortex-A15 cores clocked at 1.9GHz and four Cortex-A7 cores clocked at 1.3GHz in a big.LITTLE configuration, plus a Mali-T628 6-core GPU, while the LTE variant uses a Snapragon 800 processor, which consists of four Krait 400 cores clocked at 2.3GHz, plus an Adreno 330 GPU. The tablet has an 8 MP rear camera with LED flash and a 2 MP front camera. It's powered by a huge 9,500 mAh battery, which should sustain the large, high-res screen and the powerful SoC for long periods of usage. Expect this tablet to be very expensive, maybe even a bit below Surface Pro 2 territory. The Galaxy TabPro 12.2 is identical to the NotePro 12.2, though obviously sans the S-Pen stylus. Without the S-Pen, the TabPro 12.2 is actually a bit lighter, weighing 732g. Logically, it'll be slightly cheaper than the NotePro 12.2, though still well above the average tablet price. Much like the Galaxy TabPro 12.2 is a NotePro 12.2 sans S-Pen, the Galaxy TabPro 10.1 is essentially a Note 10.1 (2014) without the stylus. It's actually thinner and lighter than the Note 10.1 (2014), probably due to the exclusion of the S-Pen, measuring 7.3mm thick and weighing 469g for the Wi-Fi only version, and the LTE version weighs 477g, making it one of the few tablets to match the iPad Air in thickness (it's actually a bit thinner) and weight (they weigh EXACTLY the same). Compared to the Note 10.1, the TabPro 10.1 sees a reduction in RAM capacity from 3GB to 2GB. The reason for that reduction? I have no clue. Apart from that, they're practically the same, with a 10.1" 2560 x 1600 display with a 299ppi pixel density, an Exynos 5420 processor for the Wi-Fi version and Snapdragon 800 silicon for the LTE model, 8 MP rear camera with flash and a 2 MP front camera and a 8,220 mAh battery. Given its similarity to the Note 10.1 (2014), I'm assuming the exclusion of the S-Pen means the TabPro 10.1 will be a bit cheaper than its Note counterpart, I'm betting on $499. Finally, there's the iPad mini 2 competitor, the Galaxy TabPro 8.4. It has, as the name suggests, an 8.4" display with 2560 x 1600 resolution, which gives the tablet an industry-leading 359ppi pixel density. 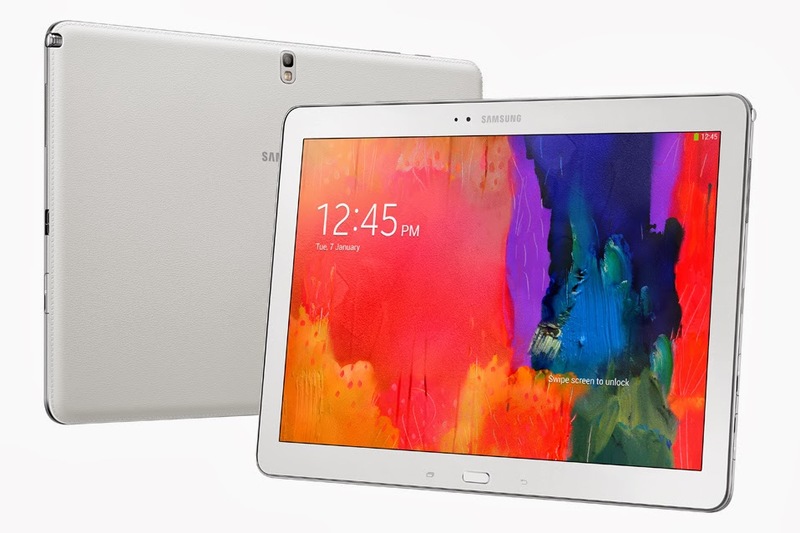 Unlike other TabPro and NotePro tablets, both the Wi-Fi and LTE versions of this tablet are equipped with a Snapdragon 800 processor, an unusual decision from Samsung. The TabPro 8.4 also comes with an 8 MP rear camera with flash and a 2 MP front-facing camera. Like the TabPro 10.1, this tablet comes with "only" 2 GB of RAM. It's very thin and light, measuring 7.2mm thick and weighing 331g for Wi-Fi only, and 336g for the LTE version. The power hungry components are fed by a respectable 4,800 mAh battery. 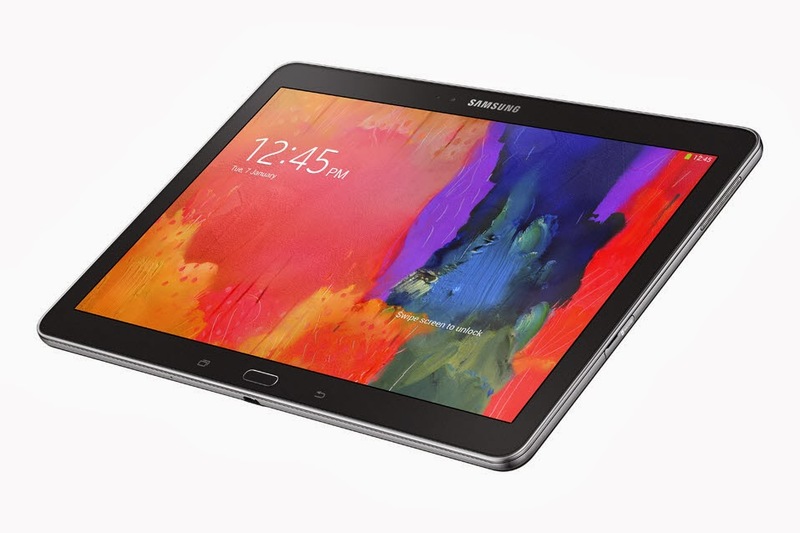 Expect the Galaxy TabPro 8.4 to be priced competitively with the iPad mini 2. Some may still prefer the iPad mini, but the TabPro 8.4 is definitely the best mini tablet in the Android space. All of the four tablets will come with Android 4.4 KitKat running out of the box. Samsung's new Magazine UX will also make a debut with these tablets. Expect the TabPros and the NotePro 12.2 to be released in February, while pricing is still not known for certain. But so far we've heard that the NotePro 12.2 Wi-Fi only will be sold for about $800, the TabPro 10.1 will be $499 and the TabPro 8.4 will cost $399. Though not officially confirmed, these prices seem very plausible. 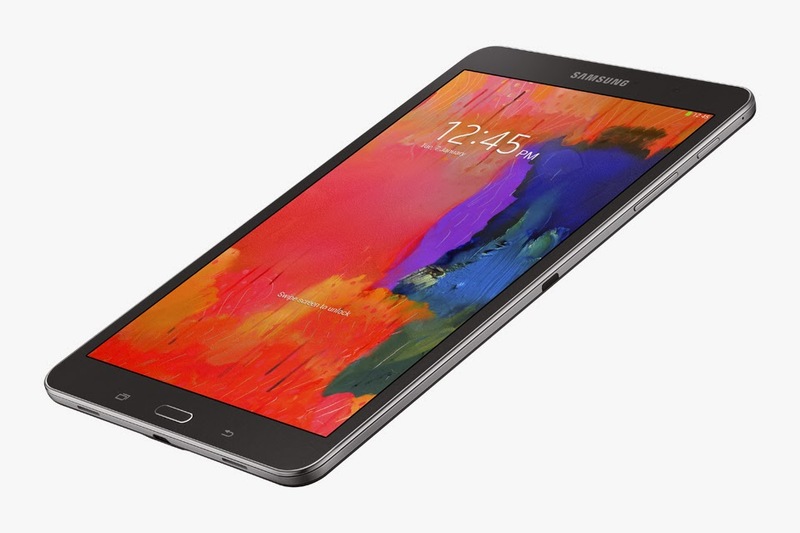 Samsung has started 2014 very well in the tablet space. The NotePro and TabPro tablets offer flagship specs, with the biggest difference between them (in the case of the TabPro line) being the screen size, much like what Apple did this year with the iPad Air and iPad Mini Retina. Expensive as they are, The Galaxy Pro tablets are bound to be the greatest Android tablets this year, if not the greatest tablets in general.